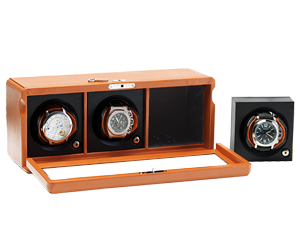 We introduce one of our most exclusive and practical cases for automatic watches with mechanism Watch Winder, designed by the best firms of Swiss watchmaking. It is a rotor case with threes spaces, handmade with the finest materials and technology in the market to guarantee the perfect preservation of your most valuable automatic watches. They are rotor cases valued for its plain and elegant design and handmade with genuine leather from Ubrique by our master leather artisans, with all kind of details and the finest finishes. 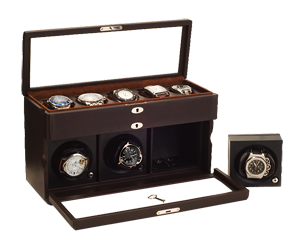 Are you looking for a special furniture to store your collection of automatic watches? 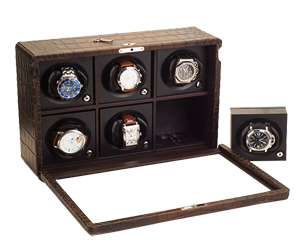 At Absolute Breton we have created the most complete leather trunk with rotors Watch Winder so that you can relish the guarantee of having a safe space for your collector\'s watches and one unique decorative object. 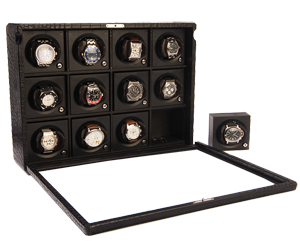 This collector\'s chest offers 24 rotors for automatic watches and 11 drawers where you can place the most delicate pieces. It is a chest handmade by the master artisans of our leather workshop in Ubrique and it has been manufactured with Swiss high-end technology: energy-efficient, soundproof and versatile rotors... Maximum quality guaranteed. At Absolute Breton we offer the biggest collection of rotors for automatic watches in the market. 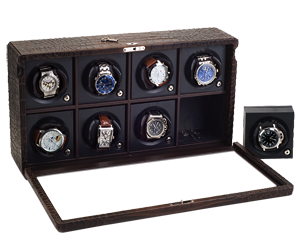 Choose your Watch Winder model and enjoy the best quality, price and customer service in every type of leather accessories and watch for collectors. 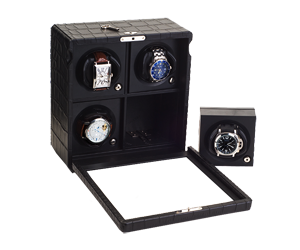 Our Watch Winder rotors offer a perfect size to store them in any space and travel safely. Its rotor mechanism makes 480 rotations and it is based on the standards of the Swiss watchmaking industry (Rolex, Bulgari, Cartier). It is energy-efficient and perfectly soundproof, and it has not any magnetic fields. 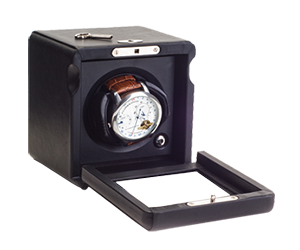 The rotor cases Watch Winder by Absolute Breton guarantee the best preservation of your automatic watches. 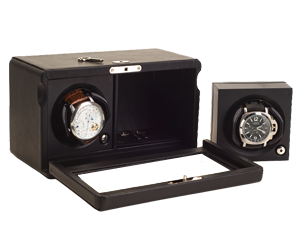 Elegant, reliable and designed to endure, our Watch Winder cases with rotors are collector\'s pieces, handmade in detail with genuine leather from Ubrique, completely customized and safe. All the cases Watch Winder of our shop offer a Swiss motor, which is energy-efficient and soundproof, they have several speeds and they are ready to be programmed at every customer taste. Space, elegance and high quality materials come together in this leather case with rotors Watch Winder, signed by the master artisans of Absolute Breton. It is an exclusive rotor case for 6 automatic watches lined in luxury natural leather with a modern programmable mechanism spinning at different speeds. It has a 24 hours rechargeable battery, which is energy-efficient and does not generate magnetic fields that can damage the watches. This watch rotor Watch Winder lined with natural leather is one of the classic pieces of Absolute Breton. It was designed to perfectly store automatic watches with all guarantees. This rotor case for automatic watches works with a rechargeable battery (2 hours for charging it completely) and the option of charge it with electricity. Interiors are lined in high-quality fabric and it is protected with a glass lid and a strong safety lock. We introduce you one of the most exclusive items for collectors by the firm Absolute Breton: an elegant leather chest to store automatic watches, fountain pens and jewellery accessories with the maximum security. This chest for collectors offers 3 rotors for automatic watches, several drawers to store watches, fountain pens and jewellery, and a secret department for the most valued pieces. It works with battery and electricity. 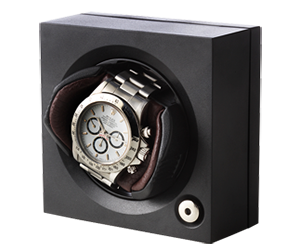 Rotor Case for Automatic Watchess, (Watch Winder).